Your front door is the first thing people see when they visit your home, and the classic look of iron doors makes a lasting impression. Their ornamental designs in iron speak volumes about your sense of creativity and style. Iron front doors are made with much attention to detail, and some of the work is still done by hand in many places. This type of door is beneficial not only for its great looks, but also to give security to your home. They are sometimes used in businesses, as well, where they give a classy impression. Although the look is classic, there are actually new designs from which you can make your choice. Custom designs are also available, along with premium finish and hardware options. Iron doors can be made in different colors, so that they will properly accent the entryway of your home. 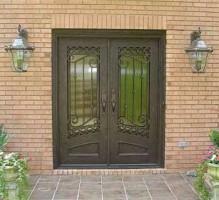 These hand-forged doors offer you stability and security, while they give your home a classic look. They will give your home a unique entranceway. You can order custom doors, too. Wrought iron doors offer heavy-duty hinges, and secure weather sealing. They are coated so that they will not be affected by rust, even in the worst elements. The doors may be made in regular stock or with custom designs that are quite unique. You may also want a door that is a combination of wood and iron. This type of door gives you the authentic look of wrought iron, while offering more contrast in color and texture. 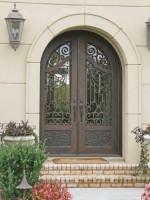 Wrought iron doors offer intricate designs in iron or wood and iron doors. These add to the individuality of each door, and the way it will complement your entryway. The perfect door is one that suits your taste and your home, as well. Custom doors can also be made, so that they are tailored to your home. Sidelights and transoms are available, to further customize your new iron door. Steel is sometimes used in the actual construction of the doors, and the wrought iron may be used for structural soundness or simply as intricate design touches. Iron doors may weigh a good deal more than conventional doors, depending on how much of the door is actually iron. The hardware is sturdy as well, to ensure that your door will be hung securely. Heavy-duty hinges are more than adequate to hold your door securely. The classic look truly completes your entryway and gives it old world charm. There are various glass options from which you can make your choice, when you are planning to have an iron door installed in your home. Weather stripping makes iron doors ideal for even harsh climates. Styles made with more wood and less iron typically feature one or more panes of glass that are set into the wood structure of the doors. They may have wrought iron bars utilized in a variety of designs, in curves or loops that are intricate in their creation. Iron doors have a timeless beauty that will add a classic and old-world style to your home. These doors are also quite durable, and iron doors last for many years. Iron, for all its beauty, is not a high maintenance product, and most wrought iron is coated, for even greater durability for your home. The design, size and layout of custom doors will factor into the price of doors, but for all their rugged good looks, they are not comparatively expensive. There are so many choices of designs, finishes, sizes and options allow for the creation of a door that is unique to your home.